We are offering the best Dubai Desert Safari Deals, It's time to get the thrill with friend and family. Dune Bashing, 4x4, Sand fording, Belly Dance, Morning Desert and many more exciting trips and deals are waiting for you. In today’s world, no doubt Dubai has become an incredible and hypnotizing area for tourist attraction throughout the Middle Eastern region. Desert Safari Deals has excellent attractions for tourist as well for local because on minor charges that provide adventure desert tour, with a lot of entertainment and free benefits. You will get all here if you want to see some excellent buildings design or tasty lands portraying nature. Dubai also offers exciting desert safari experience for those who like on a rough side of life, apart from its sky-high architectural wonders. Without any cooperation to the quality of its service. The company also takes pride in offering the best deals to those who are looking for an adventure in a cost-effective manner. Dhow Cruise dinner also deals available here. The world’s oldest and one of the largest deserts, the Desert of Arabia is lovely Dune bashing and Camel ride place. We will be providing you pick and drop off services from your pin location to your desired location depending on the package you choose. You will get a Dune drive in the cruisers and you will be driving on the top of the dunes and can touch them for better experience. You will be riding on the camels with local people and experience the beauty of the desert. you will be enjoying sand boarding and feel the adrenaline while taking a good shot from the top edge of the sand dunes. You are going to love vibes. 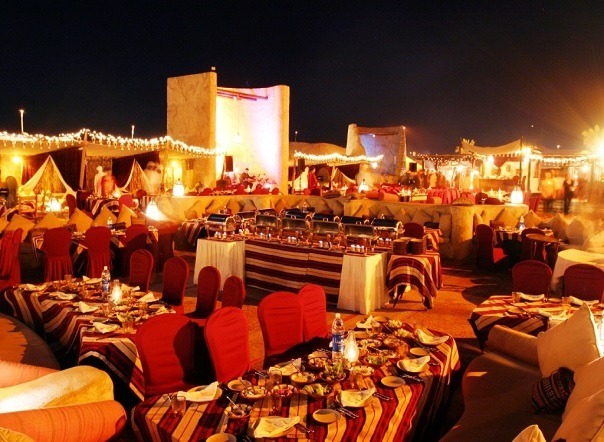 Once you are done with outside activities, then it’s time to head to Bedouin-style camp. Inside you will get to see and adopt a rich culture of the ancient Arabic themed atmosphere. We know that after doing all the fun activities you will be feeling tired so we will provide you warm drinks that include Arabic coffee, tea, unlimited water packs and QAHWA as you arrive in the camp area. We will provide you with full Arabic atmosphere as promised so you will get a wonderful Arabic style dress and you will feel the atmosphere more in you. Henna is like a natural paste made from a plant called Lawsonia Lnermis. It is used specifically in Arabian culture to texture hands, feet, and arms. You can show your artistic side by making the Henna painting on your arms and hands. Its refreshing fragrance lasts up to 3 days. You will be captivated by more than 4 live entertainment shows including, Belly dance, fire shows, Halla dance, and Tanura dance. At the end of the day, You can enjoy yourself with a great buffet meal for both vegetarian and non-vegetarian with grilled BBQ Arabic dishes and salads more than 16+ varieties without paying any additional cost. Escape the Dubai city life for in exchange for desert life. Dubai Safari offer buys one get one free. We are fervent about UAE and all it has to offer to tourists. Desert Safari is the most famous Dubai tourist activity in the world. We provide the best quality, at any rate, there is no compromise on quality. We use designated buses for pick up and drop off ( 32 Sitter or 14 Sitter coaster). We will provide a private tent with mattress, linen, pillows, and blankets. Several camps recommended depending on your needs. The camps are individually selected by desert safari experts and are clean. Safari cars are every one 4×4. From the rough ride in the desert to camel ride with the quad bike. Dubai Tour Desert Safari is offering many other activities opportunities in the Arabian Desert. Capture sandy dunes moments with your friend and family in Dubai Desert. 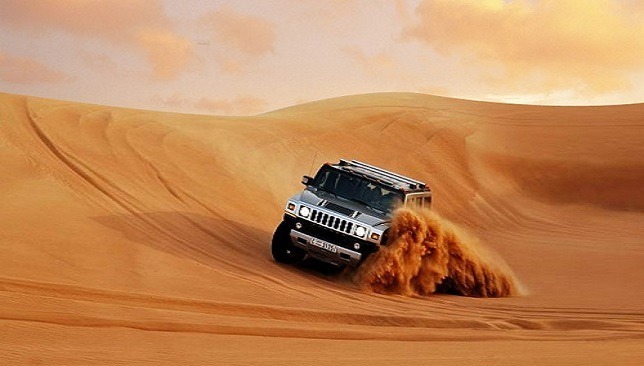 Desert Safari Dubai Deals at best offer prices starting from a 45AED. Other desert safari tour company in Dubai you have ever visited. We offer you a thrilling and adventure experience of desert safari unlike anywhere else. If you are a group of 2, 4, 6 or more just let us know and we will provide you with a quote which can match your budget. Furthermore, we can include some or can exclude to bring it to the perfect package you are looking for your desert safari tour in Dubai. We treat you as VIP, Dubai style as you travel the dunes and rolling landscape of the Dubai desert with friends and your family. 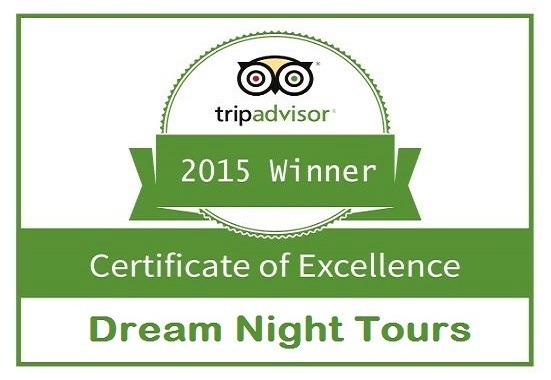 In conclusion, Desert Safari Dubai is best to venture for thrilling persons. Facilities that included in Desert Safari Dubai deal are: Pick and drop, Dune Bashing, Camel riding, Sand Boarding. Furthermore Henna Painting, Arabic Dates, Belly Dance, Tanoura Show, Dance floor, Music System, Fire Show. Tea, Welcome drinks and starter, Soft drinks and mineral water, BBQ dinner for vegetarian and non-vegetarian peoples.Tents with carpet and pillow, Dinner tables with carpet and pillows, Pray Area, Local dresses for men and women, Photography, on the other hand, Toilets for Ladies and Gents, all you will not find anywhere in Dubai. Here at Dubai Desert Safari, we give our customers an essence of the lavish life. We make a high-class atmosphere and give VIP treatment to our clients and traveller. Our staff is devoted and helpful to make you feel respected. We concentrate on providing the best quality arrangements with all the special treatments. In any case of emergency, the company provides first aid.